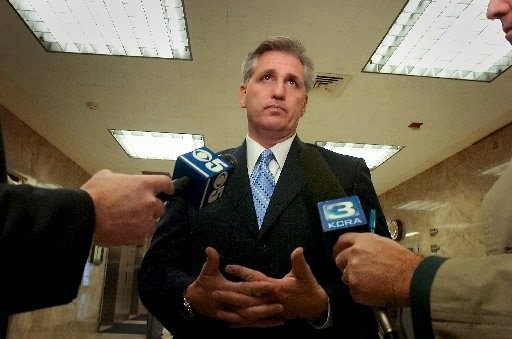 Bakersfield Observed: House Majority Leader Kevin McCarthy: President Obama faces a defining moment on Iran. Will he show real U.S. leadership or will he make the world an even more dangerous place? House Majority Leader Kevin McCarthy: President Obama faces a defining moment on Iran. Will he show real U.S. leadership or will he make the world an even more dangerous place? be able to build a nuclear bomb. But as reports of an emerging deal indicate, this injunction on an Iranian nuclear bomb may only last for ten years. That is simply unacceptable. "Iran’s active state sponsorship of terrorism has isolated them from the free world. This isolation creates a sense of obscurity for many Americans who were not old enough to remember the Iranian hostage crisis from 1979 to 1981 or who view seemingly sporadic terrorist attacks in the Middle East as simply part of the region. But within this public isolation, Iran has operated through terrorist proxy groups to exert their will and fuel sectarian conflict in the Middle East. This active engagement in terrorism has killed potentially thousands of Americans in Iraq and Afghanistan and destabilized the region. "United States and other world leaders have responded to Iranian aggression by issuing tough sanctions on their ability to take part in the global economy. As the sanctions were intended to do, the Iranian economy began to crumble, creating unrest with the Iranian people living in economic distress. This has forced Iran to the negotiating table to end their pursuit of a nuclear weapon and reassess their support for terrorism. "With Iran at the table, President Obama faces a defining opportunity to reassert America’s leadership in the world and to close the book on Iran’s malevolent hegemony. But as reports indicate, he is failing to rise to the occasion. He and his Administration have even forgotten that it is the economic pressure from sanctions that even brought Iran to the negotiating table. "Iranian leaders have been involved in efforts that have killed Americans and innocent women and children. Should a void of leadership arise in the Middle East, they will look to fill it—as they have already started to. If the Administration grants Iran global legitimacy and eases economic pressure but fails to force Iran to surrender their intention to build a nuclear bomb and support of terrorism, the world will never be the same. Iran’s influence will only increase, and a race within the region to match the Iranian nuclear capacity would almost surely occur. This is not the world order that President Ronald Reagan commanded through American leadership and it is certainly not one Republicans in Congress will stand for. America must lead because when we do not lead, the world becomes unsafe.